Tickets go on sale Friday, November 9, 2018 at 10am. Performance is made possible through a Lensic Community Sponsorship. Enjoy an hour of traditional holiday music including: A Christmas Fantasy, Huapango, The Eighth Candle, Three Moods of Hanukkah, a Christmas “POP” Sing-A-Long. And much more! 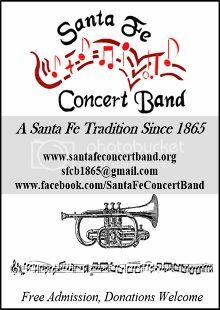 During a short break in the performance we will have a Live Auction for opportunities to conduct the band on the Santa Fe Plaza on July 4, 2019 and also to be a percussion soloist playing the bell in John Phillip Sousa’s Liberty Bell March.